I am a writer, not a publicist. Long before I ever got into blogging, I was a writer and I remain so today - just a writer who happens to love F1 as well. But my weakness in the area of promoting my work really came home to me this week. It has been a week of bloggers contributing to other blogs, the week of the guest writer, in fact. Over at Sidepodcast, Christine demonstrated how to make the most of such an event, putting up a post that alerted readers to her contribution to Ollie's fine BlogF1. As I read her article, I could not help wondering why I had not thought to do something similar for my own contributions to other sites. Just a lack of imagination on my part, I suppose. Christine had even gone to such lengths of decency as to mention my previous guest spot at BlogF1, thereby shaming me in my shortcomings at failing to mention it to F1 Insight readers. Hopefully that link up there will be sufficient apology, belated as it is. And that brings me to a more recent event: my guest article on F1 Fanatic today. I am actually quite proud of this one, considering it a good example of how a writer can waffle his way to a long piece on very little real information. It was fun to write, too. This also gives me the opportunity to recommend these guest spots on Blog F1 and F1 Fanatic; they are series and a different writer/blogger will be doing each one. That should certainly be well worth keeping up with. Then there is a forthcoming project of my own and others, soon to be announced. Consider that a teaser, rather like those ads seen occasionally that point to an important new product but refuse to name it until the great unveiling. Hint, hint. "Watch this space", or something similar isn't it? The Sidepodcast crew really know how to promote themselves, it seems as though their everywhere all at once. I guess that's the benefit of two over one. Christine's "Yet More Moonlighting" post prompted me to do similar today as well (won't be up for a couple more hours though). 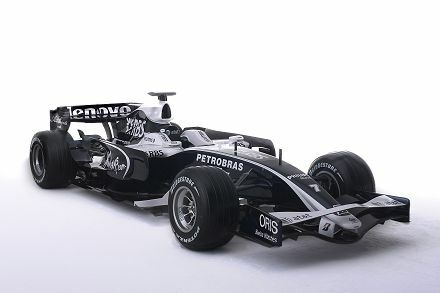 Oh, and I completely agree with the gratuitous shot of the FW30. I agree - Sidepodcast are showing us all how it's done. But that's okay - I learn quickly! Piqued my curosity you did Clive. I await your new endevor with anticipation. I hope you have it up before the race in OZ. very nice article on Keith's site I already commented enjoy! It seems we're a generous and cross-pollinating community, us F1 fans. Looking forward to the new venture! Thanks, John. More will be revealed shortly! I am always impressed with the generosity and helpfulness of the F1 blogging community, Arnet. A special breed indeed. I am too, which is why I'm always thanking people on my site and in email. Somebody once said that there is little back-biting in the F1 community, and rather compete with each other, we sort of work together for the greater good. Quite a difference to a lot of other communities and niches on the 'net. We rock! Each and every one of us. It is the comfort level we have for one another and the general respect. It is like we all know each other. But if we passed each other on the street we would never know it. We are an "intellectual family". I should copyright that saying. Just some more intellect then others I suppose. Alianora, Steven Roy and Sidey often call me to order over some inaccuracy or other that I have allowed into a post - and that is how it should be. There is no shame in getting something wrong occasionally and how else are we to expand our knowledge? The moment we think we know it all we become, ummm, Max! I think that is the essence of the F1 blogging community, that we are all learning and passionate about the sport. and I hate Max too..............and I am not to fond of Bernie either. "it seems as though their everywhere all at once. I guess that's the benefit of two over one"
spot on there. in fact i'm in awe of anyone who blogs solo. i don't think i'd find the self-motivation some days. "I am always impressed with the generosity and helpfulness of the F1 blogging community"
agreed. although we did have a comment recently from someone suggesting bloggers shouldn't cross-promote sites via comments. the argument being that we're all somehow competitors. i was quite taken aback, what would anyone gain from competing? collaboration is good. Yup, agreed totally, Sidey. Collaboration is where it's at. Commenting on a blog is a bit like visiting someone's house. If you don't know the house owner too well (as is the case with most bloggers and their commenters) you have to be very careful what you say and do, otherwise you end up with a big sticky mess like some big media sites. We, on the other hand know each other well (with John F's proviso that it is "only" on an "intellectual" basis), so we have internalised what we think each of our blogger-friends would accept on their blog and what they would not, because we all go and comment on each other's blogs a lot. Also, the level of understanding means that minor transgressions are more easily forgiven (and it helps that we don't really consider unintended inaccuracies to be transgressions so much as Version 1.0 of an article that will soon be Version 1.1). These things, and the respectfulness of differences that comes from watching a cerebral sport in the first place, all facilitate the ease with which we interact on the internet. It also means that our "cross-promotion" is not only considered within each other's boundaries, but not really "cross-promotion" at all - because we all look at each other's blogs anyway! You mention one of the things I love about blogging, Alianora - each post is not a finished article but a work in the making. As commenters add their thoughts and create conversations, our understanding of the subject increases so that we all benefit. When blogging for writers, I have mentioned that blogging is an entirely new way of writing, a matter of the writer plying his trade out there in the open with the world able to look over his shoulder. Judgement comes swiftly, so the process is much scarier than writing a book or an article for a magazine; but it is also less lonely and less likely to lead to eventual madness! I am loving this crossover idea. BlogF1 and F1Fanatic, with the help of F1 Insight and Sidepodcast. These are the best blogs on the Net giving their best content and knowledge to each other. It can't get much better than that! Oops, forgot doctorvee, that makes it 5 top F1 blogs! Amazing. Project X-27 is supposed to be secret. You can't keep giving out hints. Damn this could be read as a hint. Please ignore this message if you think it is a hint. That should cover it. I think I got away with it. Shhhhhh!